This is the opening para of the Cover Story of last Sunday’s ‘Escape’, the travel supplement of the ‘Sunday Times’. Yet another big boost for Sri Lanka at a time when the story of a few tourists being attacked by ‘beach boys’ at Mirissa has brought negative publicity for the country. 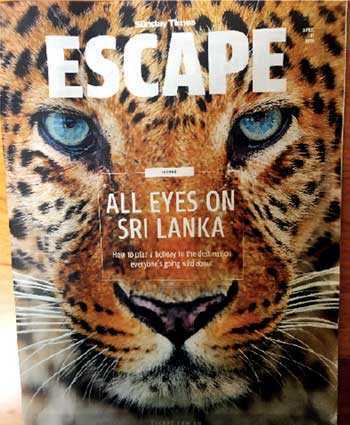 A leopard gazes at the reader as he/she picks up ‘Escape’ and is then compelled to read what ‘All eyes on Sri Lanka’ is all about. The cover itself is valuable exposure. The article describes how to plan a holiday in Sri Lanka identified as “the destination everyone’s going wild about”. As the reader opens up is a coconut cultivation covering a full page and then the story begins. The article discusses History & Culture, Nature, Breaches, and Tea before talking about how to get around, and the weather. He refers to Sri Lanka as “a heritage treasure trove” and goes on to talk about Sigiriya. “Dominated by a rock column that towers 200m above the surrounding jungle, the site also boasts unique frescoes, inscriptions and poems dating from the eighth century and a highly polished white plaster ‘mirror wall’,” he says. The nearby Dambulla cave temple complex holds about 150 Buddha statues and paintings, he adds. Touching on Nature, the article describes Sri Lanka as an island of tremendous topographical diversity, from the beaches, wetlands and rivers to the cool air, towering waterfalls and lush, green tea fields in the misty central highlands and north central valley of the Kings. 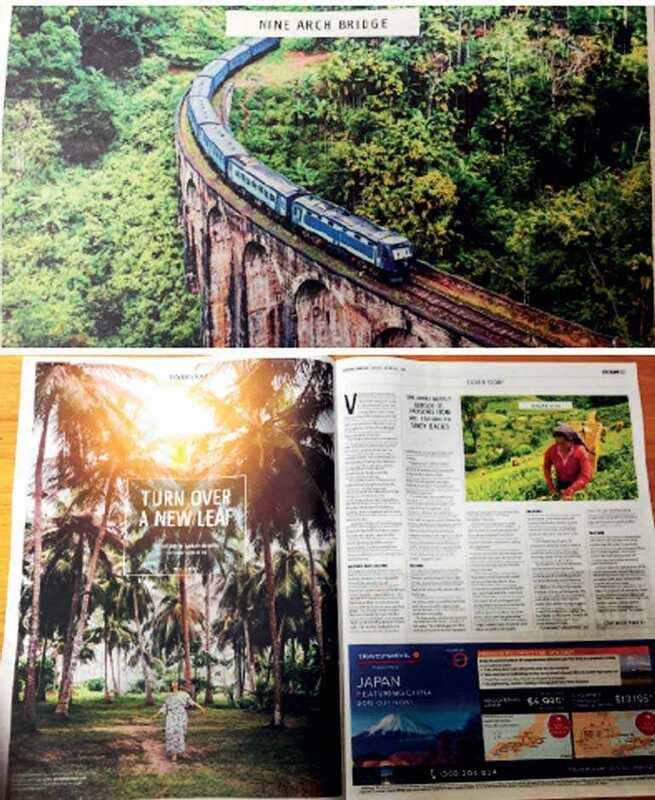 The reader is told about the train journey from Kandy to Nuwara Eliya passing through spectacular hill country past waterfalls and deep green plantations. A more vigorous exploration beginning at the Kithal Ella station, where a two-hour trek up Ella Rock is rewarded with misty views of the rugged mountains is also recommended. Lucy Jackson, a director at Lightfoot Travel recommends visits to Galle Fort and the north. “Head North (on the new train) to the uncharted territories of Jaffna. Wander the Portuguese-built fort, visit Delft Island and explore some of the oldest shrines in Sri Lanka,” she suggests. Several travel packages offered by operators are included in the article, making it convenient for those interested to plan a trip to Sri Lanka.